Went to my local library today to find a new novel or maybe an interesting non-fiction book to read. Browsing the new books shelf, I came across Your Cat: Simple New Secrets to a Longer, Stronger Life . I thought, "I'll look in the index for 'obesity' and see what I can learn about dieting options for our Raja." Hazardous to Your Cat's Health? Well, I learned a lot! There was too much to read in the library, so I took the book home and devoured it over the next couple of days. The author, Elizabeth M. Hodgkins, D.V.M. describes the "make a quick buck" attitude of most of the pet food industry. What really blew me away were her strong statements against dry cat food. It was almost scary the way she condemned dry cat food as actually hazardous to your cat's health! Yes, hazardous! This is her story in a nutshell: In more than 20 years as a veterinarian, Elizabeth treated case after case of unhealthy, overweight, and diabetic cats. And she blames most of these ills on dry cat food! I was shocked because our vet didn't really tell us the crucial role that dry cat food has in causing feline obesity. He also didn't mention that continual feeding of dry food could lead to worse health concerns like diabetes. If the author of the book was trying to scare me, man did she! Cats are "obligate carnivores" which means they are physically conditioned to eat meat as their primary source of nourishment. They are NOT small dogs or large hamsters. While humans and dogs are omnivores, which means they can derive adequate nutrition from any combination of meat, vegetables and fruits, cats absolutely cannot. Furthermore, the diet of a cat in the wild is comprised of prey like small rodents and birds. The nutritional makeup of a typical mouse or other small animal is: 55% protein, 35% fat and less than 2% carbohydrate. Cats have always been and still are capable of thriving on ONLY that combination of nutrients and ONLY from animal sources. Notice the low, low carbohydrate percent! Humans and dogs have different physiology and can manage, and in fact need, a good percentage of carbohydrates to burn for energy. Cats, on the other hand have no mechanism for handling carbohydrates greater than 10% and will suffer obesity and/or diabetes if fed high carbohydrate food. They get energy by converting protein into energy, unlike the rest of us that use mainly carbohydrates for that purpose. Cats are true Atkins (or "Catkins") diet creatures. But for them it's not a crash diet, it's the only way to have a healthy life. So, what's the problem with dry cat food? OK, that's the author's anatomy lesson about cats and explains the necessity for high protein, low-carbohydrate food in a cat's daily diet. When you check the nutritional makeup of even the best premium dry cat foods, you'll be amazed to discover just how high in carbohydrates these supposedly "good" and "scientifically balanced" foods are. Notice that ALL of these so-called premium dry foods are high in carbohydrates! And even the lowest carbs are a whopping 29%! A far cry from a maximum of 10% in a healthy cat's diet. 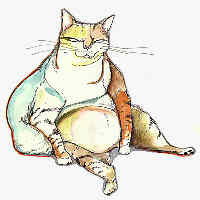 No wonder our feline friends are fat!